The VRX 2.0 waterproof jacket features a 100% waterproof and breathable inner lining. A removable thermal lining and multiple vents help regulate body temperature in any condition. CE-approved armor in the shoulders and elbows combine with the 600 denier outer shell to make this a great performance riding jacket. 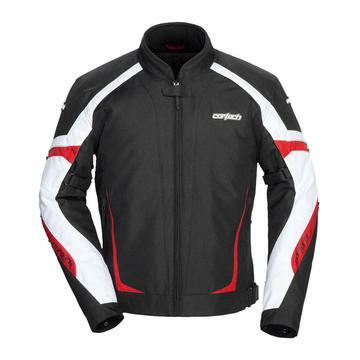 • Performance cut, abrasion-resistant 600 denier Carbolex® polyester outer shell. • Shoulder, upper arm, and rear zippered vents. • Rainguard® waterproof and breathable barrier. • Cortech Z.O.Q. (Zip-Out Quilted) liner features warming 100g polyfill insulation in the body and 80g insulation in the sleeves. • Pre-curved and rotated sleeves increase comfort. • Adjustable sleeve take-up straps for a perfect fit. • Phoslite® reflective piping and Cortech signature reflective rear triangle for better nighttime visibility. • Removable Armadillo® CE-approved armor in the shoulders and elbows, and a revised articulated triple-density back protector. • Microfiber-lined mandarin collar and hook and loop adjustable microfiber -lined cuffs. • Two hand warmer pockets, interior mobile phone pocket, and interior storage pouch. • Adjustable waist belts with TPR pulls help to fine tune the fit. • Includes an 8" jacket/pant zipper attachment with pant side included.